A review of “Lest they Perish”: The Armenian Genocide and the Making of Modern Humanitarian Media in the U.S., 1915-1925, by Jaffa L. Panken. How do you make people care? What does it take for individuals to donate resources to a cause that involves foreign people in faraway lands? How can the public be convinced that they are morally responsible for a distant people’s suffering and therefore should work for its alleviation? Near East Relief (NER), a US-based international humanitarian aid organization, had to find effective answers to these questions to raise funds in order to cover the ever-growing needs of the survivors of the Armenian genocide during and immediately after World War I. Jaffa L. Panken’s dissertation investigates the media strategies that this relief organization crafted from their initial establishment in September 1915 in NYC up until 1923 when their operations came to an end in Asia Minor. This fine study of the history of the NER consults handbooks, instructional manuals, internal reports, publicly circulated articles, advertisements, illustrated posters, films, billboards, photography, and films to argue that modernization of international humanitarian media owes its roots to the ways this American organization responded to the Armenian genocide. Panken traces NER’s development and adaptation of commercial techniques to publicize the Armenian plight and demonstrates how NER committed to a “politics of pity” by using media to encourage spectators to identify and sympathize with the sufferers. Especially after 1919 rather than focusing on perpetrators and perpetrations of violent acts, NER directed the potential donor’s gaze to the sufferers. Thus, NER did not initiate feelings of indignation or injustice but pity and sorrow, and thus assumed a non-interventionist and neutral outlook in public. The first chapter of the dissertation delves into the early years of the organization, from 1915 to 1917, during which it was called the American Committee for Armenian and Syrian Relief (ACASR). Upon the encouragement of American Ambassador to the Ottoman Empire Henry Morgenthau and through the mediation of the Secretary of State Robert Lansing, a few known philanthropists, religious leaders, and businessmen in NYC formed a committee to raise emergency funds “to save some of the Armenians” (p.25). ACASR were given access to all reports that the State Department received from the Ottoman Empire. In turn ACASR prepared its own report and publicized it in the newspapers. Publicity material from these early times consciously avoided detailing accounts of massacres and death as the organization’s leadership decided that they did not want to appeal to imagery or emption; facts would speak for themselves and motivate people to donate to the cause. At this time the U.S. was a neutral country and many American missionaries in the Ottoman Empire were the eyes and ears of the organization oversees. As the Armenian crisis deepened in late 1915 and 1916 the organization grew, especially after its collaboration with Laymen’s Missionary Movement, a non-denominational Christian organization that channeled businessmen’s expertise towards evangelical concerns. Publicity materials emphasized that the Armenians were “the oldest Christian nation” and that Americans had to respond to the suffering of these martyrs and bring about their redemption. A language of “terrible Turk” or other anti-Islam rhetoric, reminiscent of 19th century missionary language was used. The dissertation’s second chapter takes an innovative break from NER and Armenians to describe the Commission for Relief in Belgium (CRB). The two relief endeavors had many things in common: they were dedicated to the relief of non-combatants in war zones, appealed to the American people for donations, and both had connections to the U.S. government but were non-governmental agencies. Despite such commonalities, the two organizations went in different directions and this is the reason Panken includes the Belgian relief in this dissertation about NER and Armenians. As she maintains and as has been noted by other historians, Belgian relief had a higher profile than Arm relief, despite the magnitude of the latter (p.53). While the causes for such divergence are multiple (and range from the timing of the events to the fact that Belgians had a government but Armenians were Ottoman subjects) the relevant point is how the two organizations’ usage of publicity media differed. CRB relied on government agencies, especially the British propaganda machinery, which promoted their own vision of “poor little Belgium.” In order to bring the US into war against Germany, the British government propaganda demonized the Germans and provoked sympathy for Belgium. Panken analyzes these posters and shows how sexual violence especially against Belgian mothers and adult women were used to trigger pity for the Belgians. ACASR did not have a governmental agency to make publicity available for their cause; they had to produce it on their own. Given the fact that Americans were not as familiar with Armenians as much as they were with Europeans, the ACASR’s job was to familiarize the American public with Armenians so that they cared and paid. Chapter 3 focuses on NER’s 1919 campaign which aimed to raise an unprecedented $30,000,000 for, in President Wilson’s words “war sufferers” so that the American people helped “re-establish these ancient and sorely oppressed people in their former homes on a self-supporting basis.” Panken analyzes this campaign which was qualitatively different from NER’s earlier campaigns in its appeal to the mainstream public and not just to church-goers and philanthropically minded businessmen. NER collaborated with the Committee for Public Information, which, after the U.S. entry to war in April 1917, produced 40 million war-related posters to ensure the public’s support of the war. NER commissioned the Committee’s Division of Pictorial Publicity and their artists to produce its posters which focused on the theme of hunger, starvation, and perishing. Panken discusses not just the iconic NER posters but also the illustrators who produced poster art in various formats. 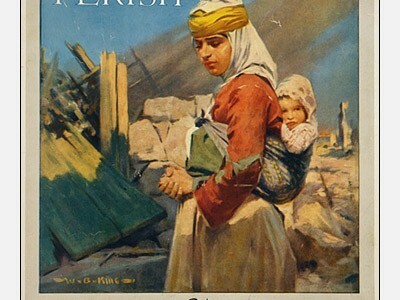 These publicity materials, which were essentially meant to invite Americans into the suffering of Armenians as witnesses relied on Armenians’ and Americans’ love of children and respect for motherhood in order to minimize the gap that separated Americans from Armenians. Chapter 4 turns the attention to the Ottoman Empire where NER began operating hospitals, rescue homes, shelters, and orphanages after the declaration of the Armistice. NER’s publicity department required their teams in the field to send pictures back home in order to use photographs in their fundraising efforts. In most of these photographs Armenians were starving, diseased orphans. These emaciated Armenian bodies were saved by American medical personnel who were, thanks to the money sent by the American public, were working to bring redemption to Armenians. Panken details the involvement of American Woman’s Hospital’s doctors in NER’s field operations as well as fundraising efforts. She traces how the portrayal of Armenians changed from those pleading help in the 1918-1919 US-produced posters to naked, fragile bodies in the photographs sent from Asia Minor or Mesopotamia in which the bodies were spectacles of tragedy. After the Armistice Americans used caution in their relationship with the Ottoman Turks (as well as the Kemalist resistance movement), the NER personnel emphasized starvation and famine rather than deportation, massacres, and a man-made catastrophe that we now call genocide. Chapter 5 re-adjusts the focus back to the U.S. and discusses how from 1919 on NER used film, celebrity spokesmen and product placement to appeal to the American public’s conscience. Panken details NER’s sponsoring of the production of the film Action of Souls which was about the life and predicament of a young Armenian girl. Aurora Mardiganian went through hell in the Ottoman Empire during the war. She was deported with her family, witnessed them die, was kidnapped multiple times, forcibly converted to Islam, tortured, raped, and sold into slavery until she managed her way out to the Caucasus and then was sent to the U.S. via Norway with a missionary physician’s help. In the film version of her life she played herself. Auction of Souls, which was accompanied with intense publicity campaigns, featured in movie theaters throughout the country. Another novelty in humanitarian media was the engagement of celebrities with the relief cause. Child star Jackie Coogan which helped sell commodities such as peanut butters and baby dolls was now going to sell the Armenian relief. He organized a “Children’s Crusade for the Near East” and thus earned the title “first celebrity humanitarian.” The third novelty was the incorporation of the food corporations in the relief fundraising machinery. Borden Milk Company, for example, agreed to match every purchased can of their condensed milk with another can donated by the company to the NER. This way these companies, which included corn syrup manufacturers, received NER’s legitimacy as a corporation that sold food with high nutritional value. While the themes of family, pity, and duty continued as the main NER messages about Armenians, the message was now conveyed to the individual as a consumer. Americans could now express their sympathy through daily choices. “Lest they Perish” is a well-written, thoroughly researched, and an analytically strong work that contributes to various literatures such as the history of humanitarian aid, humanitarian media, wartime America, and American responses to the Armenian genocide. Once published in book format it is going to be an invaluable source to those who are interested in the Great War, Armenians, humanitarianism, and relief organizations. University of Pennsylvania. 2014. 237 pp. Primary Advisor: Kathy Peiss. Image: Poster by the American Committee for Relief in the Near East. Wikimedia Commons.